The Brazilian red and white tarantula is a larger tarantula with a diagonal leg span of approximately 15–17 centimetres (5.9–6.7 in). The Brazilian red and white tarantula is found in the tropical forests and savannahs of Brazil and Paraguay. The Brazilian red and white tarantula is noted for its white striped legs, beige to grey prosoma, and the reddish hairs on the opisthosoma. Males and females look the same until the ultimate (final) moult of the males. At this point the male will exhibit sexual dimorphism in the form of a duller coloration and legginess. Additionally males will gain embolus on the pedipalps and tibial apophysis (mating hooks). The Brazilian red and white tarantula is a terrestrial species that will often make a burrow or make use of an abandoned burrow. 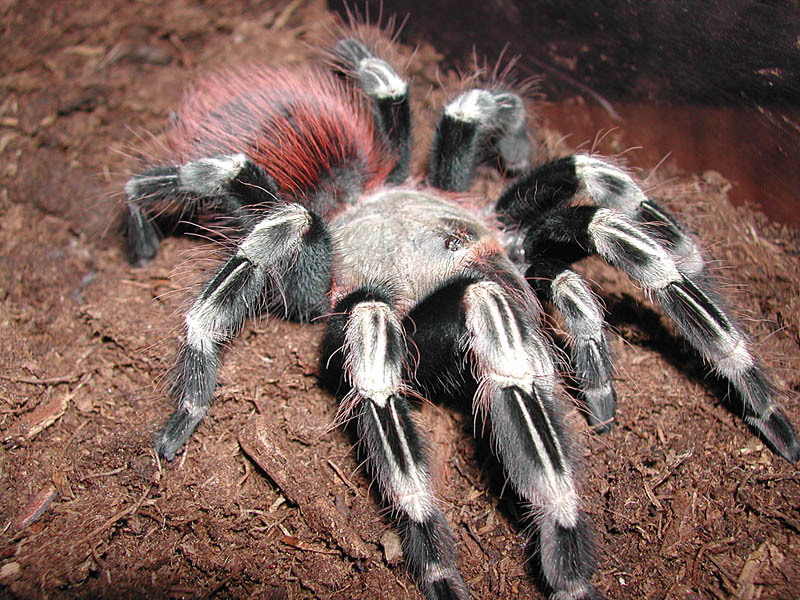 The Brazilian red and white tarantula is reputed to be quite defensive with its urticating hairs. The female Brazilian Red & White Tarantula lives for approximately 15 years whereas males will die usually just after reaching maturity at 4 years. Click HERE for a Brazilian Red & White Tarantula care sheet.